Researcher Hanne Lovise Aannestad at the Museum of Cultural History and the plank from the Gokstad ship. The footprint is made more visible by forskning.no. 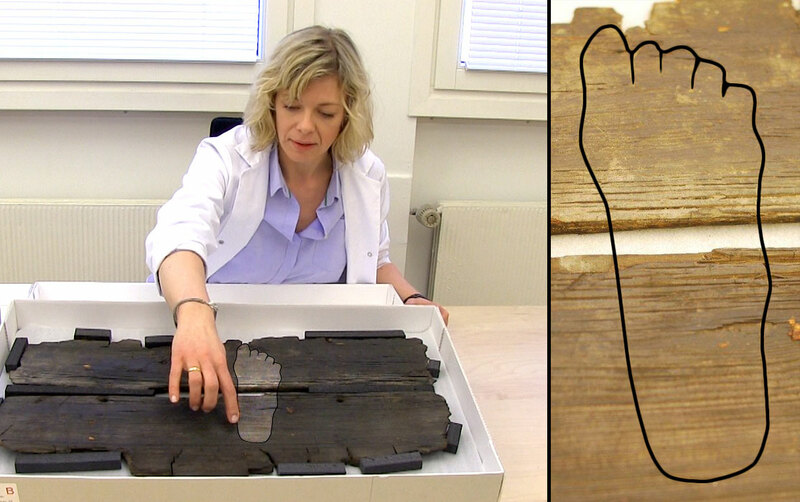 In 2009, researchers discovered two feet outlines carved into two planks on the Gokstad ship: The right foot is quite visible while the outline of the left foot is only partially visible. The right foot is 22 centimeters long, which corresponds to shoe size 4 (Europe; 35). Although the Vikings had a lower average height than we have today, this foot very likely belonged to a young man. – I am not leaving you any property; you only have what you acquire with this sword. When a boy was between 10 to 12 years old he should be able to participate in sports games and travel with adults, and when he was 15 years old he had the right to own property. It is the month of May, the year is 892 AD and Harald Fairhair is king of Norway. A beautiful, almost new Viking ship embarks from one of the fjords of Western Norway, bound for the east coast of England. The shipowner, Viking chieftain and farmer Tore, has received permission from the king to cross the North Sea to join the other Scandinavian Vikings who have established themselves in Jorvik (York). The goal is to plunder the South of England and return home with gold, silver, healthy slaves and other trade goods. – You have got a good upbringing, and now you get the honor of showing the Gods that you have become a man. A light breeze pushes the ship slowly towards England. The Vikings are hoping for more wind so that the crossing goes faster. Some rest in the shadow of the large sail, others eat dried meat while one of the Vikings sharpen his battle axe. Little is said, and no one is talking to Eirik. They see him just as a kid who has not yet been into battle. Eirik is bored, and takes the knife he got from his father out of the sheath. He starts to draw around his right foot, wishing he had been taught the runic alphabet. In the year 900 AD, Viking chieftain “Tore” dies in battle in South of England. He is brought back home and buried inside the so-called ‘Gokstad ship’. Including other objects, there were found 12 horses, six dogs, a peacock and three smaller boats. Weapons, jewelry and other metal objects had been taken by grave robbers. The Gokstad ship is clinker-built, constructed largely of oak. The ship was intended for warfare, trade and transportation of people and cargo. The ship is 23.24 meters (76.2 ft) long and 5.20 m (17.1 ft) wide. The ship could carry a crew of 40, including 32 oarsmen, but could carry a maximum of 70. The oar holes could be hatched down when the ship was under sail. It utilized a square sail of approximately 110 square meters (1,200 sq ft), which, it is estimated, could propel the ship to over 12 knots (14 mph; 22 km/h). The mast could be raised and lowered. While the ship was traveling in shallow water, the rudder could be raised very quickly by undoing the fastening. Dendrochronological dating suggests that the ship was built of oak that was felled around 890 AD. This period is the height of Norse expansion in Dublin, Ireland and Jorvik (York), England. 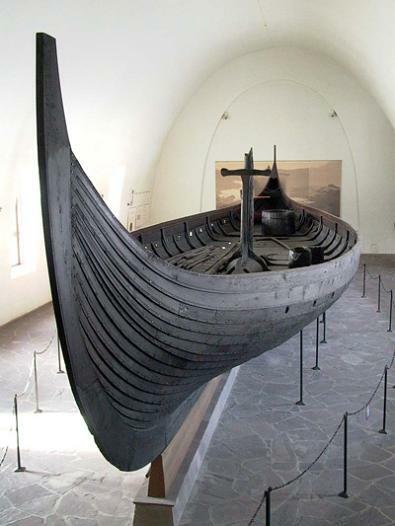 The Gokstad ship was commissioned during the reign of Harald Fairhair at the end of the 9th century. Around year 900 AD, the Gokstad ship was put in a burial mound, and it is unclear who joined the ship into eternity. The skeleton of a man in his 40s who was 1.85 meters tall was found in a bed inside the mound. Studies of the skeletal remains show that the man was exceptionally powerfully built, and died from combat injuries.